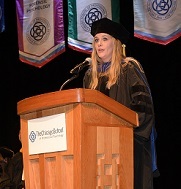 Final TCSPP 2017 commencement closes out year with enthusiasm and high expectations. 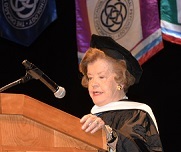 (Washington, D.C.) (NOVEMBER 06, 2017)– The October 27 Washington, D.C. Campus commencement ceremony was host to honorary degree recipient, Martha Farmer, founding and executive director of Leadership America; distinguished alumna Sonya Bruton, Psy.D., chief operating officer, CCI Health and Wellness; and student speaker, Rachel Altvater, Psy.D, postdoctoral resident at The Gil Institute for Trauma Recovery and Education. The three dynamic and accomplished speakers each sought to inspire and enrich their audience of 103 new graduates and their more than 800 proud family members and friends. 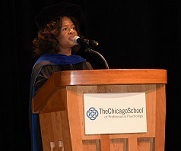 “Every difficult case, class, professor, externship, paper or research question had a purpose: to form you into a multifaceted key that will unlock the doors of change or lead you to the answer to someone’s problems,” advised Dr. Bruton, a 2016 graduate of the Washington, D.C. Campus’ Clinical Psychology Doctoral Program and a mental health care innovator who while serving as a doctoral intern, introduced and launched 30-minute brief visits designed to foster the behavioral change needed to improve medical conditions.